It’s finally here! Day twelve of the Twelve days of Christmas. In case you missed any of the first eleven days, I’ve done a recap below. In the meantime, I’m just going to jump right to it. 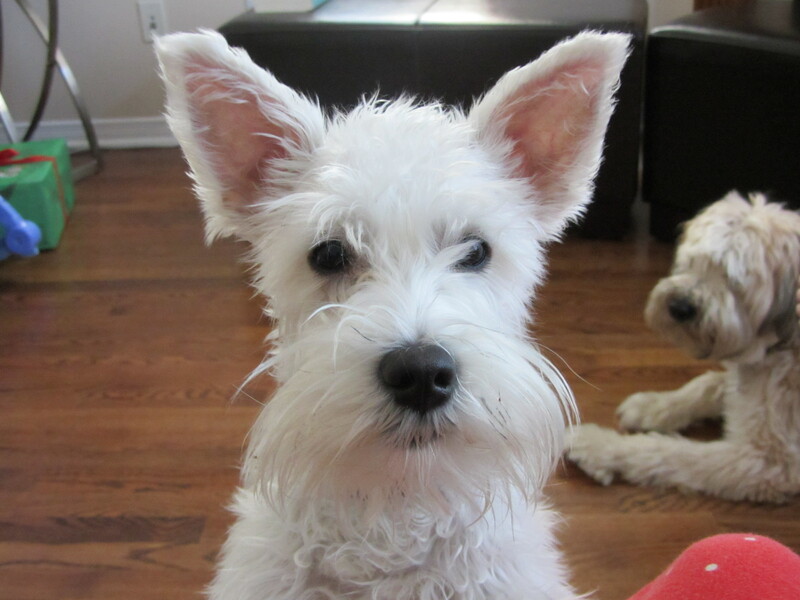 I have a white mini schnauzer, Zoë (one half of z²), who looks just like the pup on my card. To cut the schnauzer shape, I used a file from the Silhouette store. I traced a santa hat and then cut all the parts using my Silhouette Portrait cutting machine from various colours of heavyweight cardstock. While I was at it, I also cut a bone background stencil from a piece of plastic transparency paper. I used a piece of Ranger Distress Stamping Paper for my background and positioned the stencil over top so that I could apply Ranger Distress Embossing Ink and then heat emboss with pearly powder. After I heat set the powder, I applied green watercolour over the embossed bones to create a resist. Once I let the watercolour dry, I used a baby wipe to rub any green paint off the bones. I used the same ink and pearly embossing powder to add a little shine to the bobble and trim of the santa hat before assembling it with Ranger Matt Medium glue. I assembled my paper Zoë by tying a bow around her neck, adding the eye and nose, and adhering on the santa hat (with Tombow Mono liquid glue). To finish my card, I adhered a piece of patterned paper from Lawn Fawn’s Peace Joy Love collection onto my white cardbase and then used foam tape to adhere the bone background and my Santa Paws Zoë to add lots of dimension. Thank you so much for dropping by and sticking with me through this series. I’m going out of town for the holidays so I wish everyone a safe and happy season! Woof woof from z²! First day, Second day, Third day, Forth day, Fifth day, Sixth day, Seventh day, Eighth day, Ninth day, Tenth day, Eleventh day. Welcome to day eleven of my Twelve Days of Christmas feature. For today’s card, I wanted to play along with the Colour Me…! Colour Challenge. 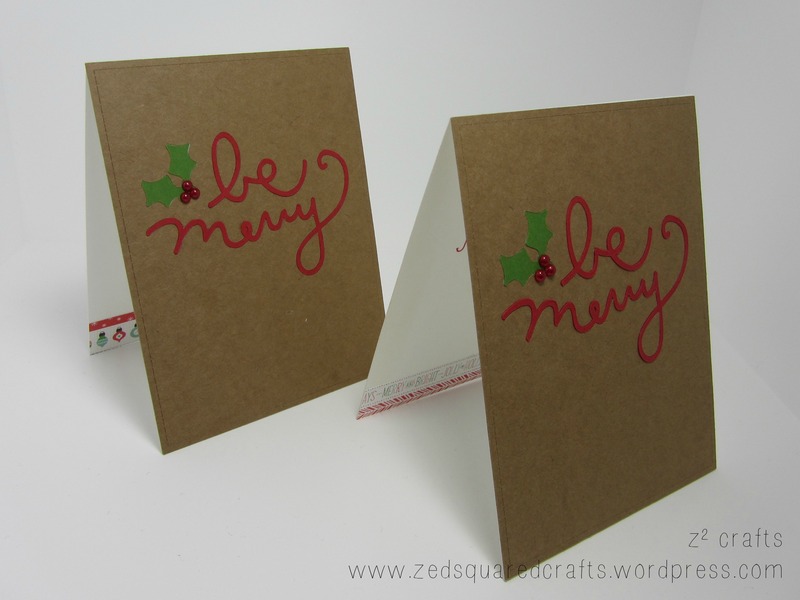 This week, the CMCC#51 is to create a project using kraft, green, and red. Since it’s so close to Christmas, I created a very simple card using inlaid cuts (a free file) from my Silhouette Portrait. Thank you so much for stopping by! In case you missed it, you can see the tenth day of Christmas here. Welcome back to my Twelve Days of Christmas feature. Today’s post includes another video! The card that I create was inspired by a gift certificate sleeve I crafted for a family member. I wanted to share the idea, but not spoil the surprise so I created this card. 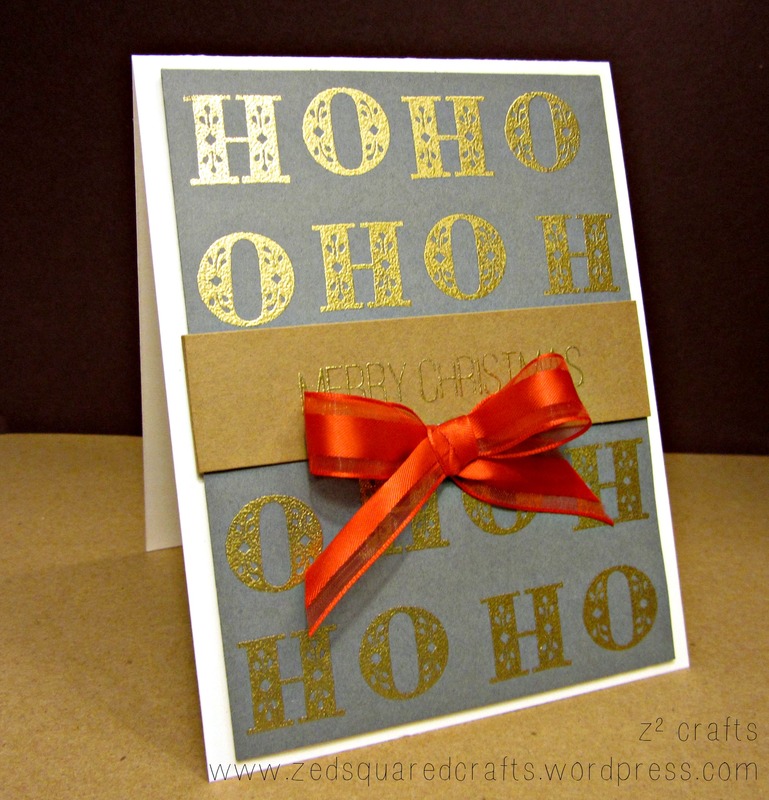 …a ho ho ho card. Thank you to everyone for all your support! 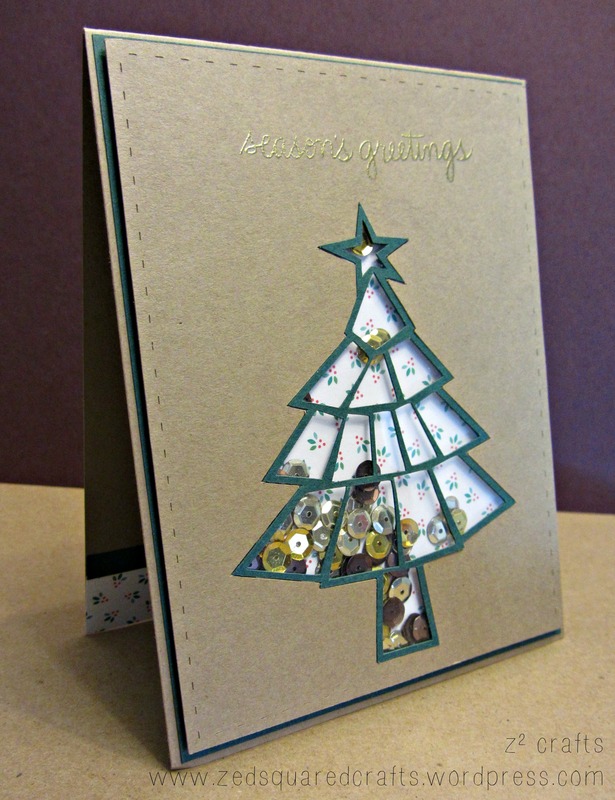 If you missed it, check out day nine of the Twelve Days of Christmas. Welcome to day nine of my Twelve days of Christmas feature. Today is a BIG post because it includes a YouTube video! I have worked through technical challenges, taught myself how to film, edit, and voice over, and finally, I did it! Ink: Distress, Gathered Twigs; Memento, Tuxedo Black; VersaColor, 55 Umber. If you liked the tutorial, I do have one other video posted for the Sparkle and Shine card I shared last week. One last thing before I sign off, z² crafts officially joined Facebook this week. Feel free to check out the page. Thanks so much for dropping by! Have a great week! Welcome back to my Twelve days of Christmas feature. Thanks so much for tuning in! To make this card, I started in Silhouette Studio with a free Christmas tree cut file (it’s one of the free ones that comes with the software). I cut the tree outline from my kraft panel, and then the whole tree shape from a dark green cardstock using my Silhouette Portrait machine. I used a piece of Lawn Fawn patterned paper from the Snow Day petite paper pack for the background and filled the shaker using gold and brown sequins. To finish off the shaker, I used two layers of foam tape, and a piece of clear acetate behind the kraft panel, and then adhered the green tree over top of the window. I like how the tree has a bit of a wonky stained glass look. 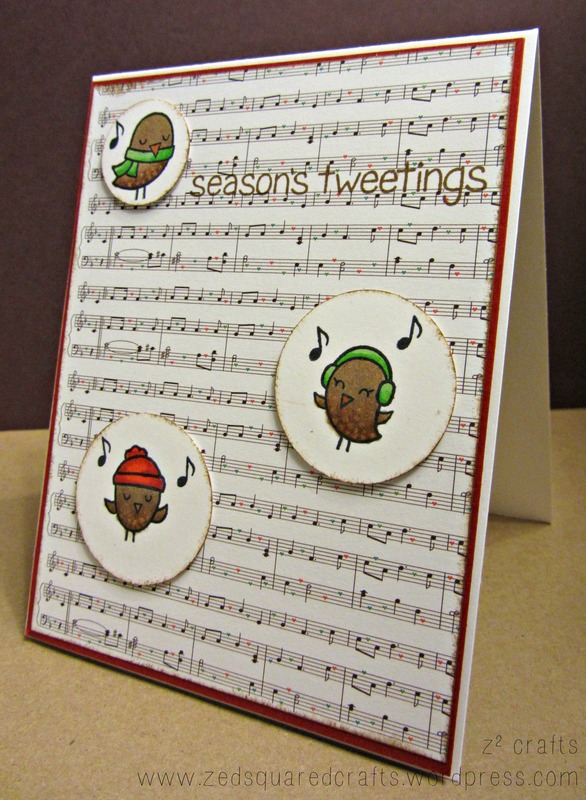 I stamped the Season’s Greetings sentiment from the SSS Be Joyful stamp set, and heat embossed with Ranger Super Fine gold embossing powder. Thanks again for dropping by. Make sure to check out the first seven days of Christmas if you missed them.